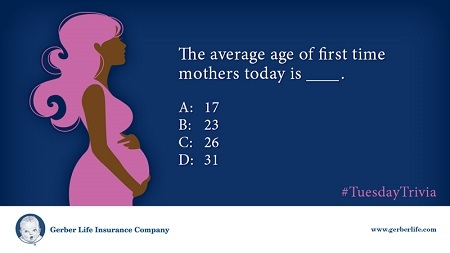 #TuesdayTrivia Question: The average age of first-time mothers in the United States currently is ___. 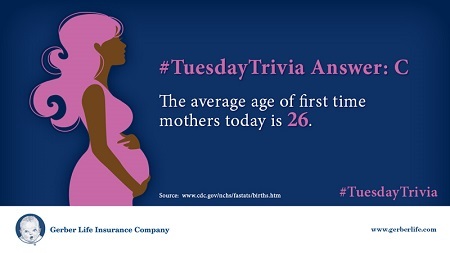 #TuesdayTrivia Answer: The average age of first-time mothers in the United States currently is 26. According to the Centers for Disease Control, the age of first-time moms is on the rise, with more than nine times as many births to women over age 35 who were giving birth for the first time than reported for the 1970s. Decline in birth rate for teenage mothers. There was a 6% decline in births to women aged 15-19 from 2011 to 2012. Birth rates were also down for women aged 15-17 and 18-19. Decline in birth rate for women in their 20s. Increase in birth rate for women 30 to 44 years old.